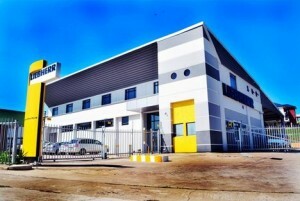 Liebherr Africa has opened a new maritime crane sales and service centre in Durban, South Africa. Located just outside of Durban, the new centre will offer sales, service and spare parts for all maritime products throughout southern Africa. As well as providing operator, technician and service staff training it will also feature maritime crane simulators for virtual training of ship to shore cranes, mobile harbour cranes, rubber tyre gantry cranes and offshore cranes. The company said one of the main drivers for the new centre was a steady growth in demand, as well as its close cooperation with rail, port and pipeline company Transnet which operates more than 60 Liebherr cranes – 13 harbour cranes, 31 ship to shore container cranes and 18 rubber tyre gantry cranes. Established in 1958, Liebherr Africa is a wholly owned subsidiary of the manufacturer, covering the local mining, construction and civil engineering industries.